Policeman’s bullet hits man’s eye in Ibadan. 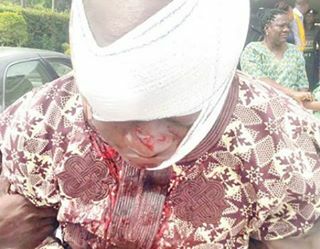 A shot fired by an unidentified policeman attached to Police Area Command, Idi-Ape Ibadan, on Monday, hit one of the eyes of one Yomi Olaitan, around Oje market, Agodi Gate road, Ibadan, reports Tribune. Olaitan who was driving a brown Honda Accord car behind a truck, was hit in the right eye. Sources informed that the truck driver was engaged in a heated argument, allegedly related with money issues, with the police officers. The driver of the truck reportedly refused to play ball, this led to a prolonged argument and subsequent shooting by one of the policemen. The younger brother of the victim, immediately, stopped one of the officers from escaping from the scene. Olaitan’s brother, sources informed, also collapsed in the process of dragging the issue with the police officers. He was however revived by good-spirited people as he joined his brother, while being taken to the University College Hospital (UCH) Ibadan. Olaitan is being prepared for surgery, as it was gathered that his brain was not affected. When contacted, the Police Public Relations Officer (PPRO) Oyo State Police Command, SP Adekunle Ajisebutu confirmed the incident, but was quick to add that it was unintentional and had nothing to do with extortion. He said the truck driver had caused an accident, due to reckless driving, and had abducted an FRSC staff who wanted to arrest him. The policeman, however, shot at the truck's tyre to demobilize it, but a bullet ricochetted and hit the victim in the eye.